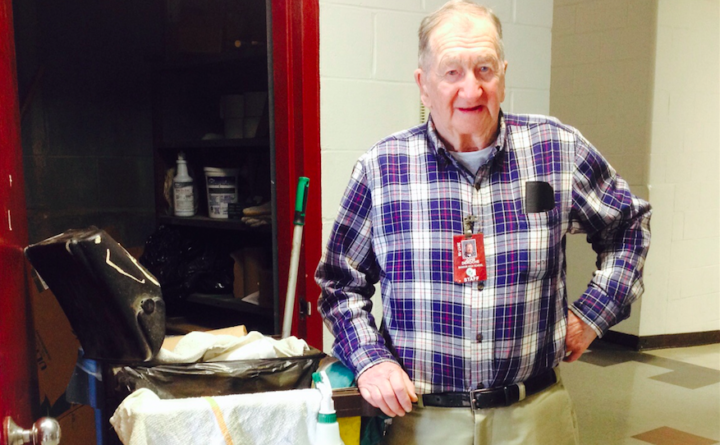 John DeRoche, 78, of Bangor prepares for work Friday as a janitor at Bangor High School. The judge gave "great weight" to his testimony against Philip Scott Fournier in the Joyce McLain murder trial. Superior Court Justice Ann Murray found Fournier guilty of murder Thursday. John DeRoche never knew Philip Scott Fournier had confessed to anyone but him when the Bangor High School janitor took the stand last month in the Joyce McLain murder trial. It wasn’t until he saw news reports about that day’s testimony that DeRoche, 78, of Bangor learned that Fournier’s off-handed confession to him in 1989 confirmed statements he’d made about killing McLain eight years earlier to his minister, the Rev. Vinal Thomas, and parents, Anita and Wayne Powers. DeRoche testified last month that Fournier bragged to him about killing McLain in 1989, nearly 10 years after her body was found on Aug. 10, 1980. Both worked at what was then Husson College as janitors. The U.S. Navy veteran, who has two daughters who are close to McLain in age had she not been killed, came forward to tell his story the Monday after Fournier was arrested on Friday, March 4, 2016. He told police and, nearly two years later the judge, that Fournier worked for a year at Husson beginning in June 1989. DeRoche, who was a janitorial supervisor, asked Fournier his first day on the job about McLain’s murder when he learned where Fournier lived. A few days later, DeRoche said, he asked Fournier why he had not been arrested. “He said that he’d been interviewed 20 times or more and he’d ‘beat all the interviews,'” the janitor testified. DeRoche said he told Husson security in 1989 there was a suspect in McLain’s murder working at the college. The information apparently was not passed on to the Maine State Police. The janitor said Friday that he was nervous about taking the stand. DeRoche said Friday that he learned Fournier had been convicted from the victim witness advocate shortly after the verdict was announced. Assistant Attorney General Leane Zainea said Friday in an email that what the U.S. Navy veteran told Murray was important to the prosecution’s case. “[Fournier] had disclaimed any involvement in 1981 [in McLain’s death] and was consistent in all subsequent interviews [with police],” the lawyer said Friday in an email. “This DeRoche allegation stood in stark contrast chronologically — [it was] difficult to allege that DeRoche was lying because he came forward before any details had been released by the affidavit. DeRoche said that he has read the judge’s decision but needs “to study it” to understand exactly what role he played in Fournier’s conviction. He also wants his experience to be a lesson for the students he interacts with every day. “They should speak up when they see something, even if it’s years later like what happened here,” DeRoche said. DeRoche grew up in south Brewer and graduated from Brewer High School in 1958. Two weeks after graduation, he joined the Seebeas, the construction arm of the Navy. He had been out of the service for about a year when he read the news reports about McLain’s death in 1980. He worked for the YMCA before going to work for Husson in 1988. DeRoche has worked for the Bangor School Department since 1996. DeRoche said Friday that he plans to work another five years.